Though I’ve been reading comics since the 1970s, the early 1990s is when I started buying a lot more of those. Though those were the years of Doom Patrol, Sandman and other landmark series, we also got treated to material such as much of the Image launch, which was, err, different from the two series mentioned above. Still, I have a poorly-justified nostalgia about this stuff, and decided to write a few characters up. While the books were usually terrible, the characters have a simple, obvious quality to them. They’re largely clichés, which means they can be useful and easy to use in many campaigns. The various Image books started in the same, generic universe before splintering off due to creative differences and office politics. Thus, early events in the Awesome/Extreme universe involve characters, organisations, etc. which later become part of the Wildstorm Universe, of the Larsenverse, etc.. In fact they did so as much as possible as a simple form of cross-promotion. Known Relatives: Younger sister (name unrevealed, deceased). Base Of Operations: Brigade HQ in Malibu, CA. Height: 5’10” Weight: 145 lbs. Lethal is a top-notch assassin and martial artist, usually using bladed weapons. She seems to operate at a slightly better level than the innumerable, undifferentiated legions of combat badasses then populating the Image books. Lethal is once overpowered by Vogue, but that happens in a problematic alternate future that did not inform our game stats. Lethal also seems to be a brilliant computer technician and network user. She’s able to build supercomputers from scavenged parts and to hack her way to restricted information with a keyboard as well as a sword. Like most Awesome/Extreme characters, she also has the ability to occasionally make her eyes look weird for no known reason. Lethal worked with Battlestone, Boone and Kayo before the founding of Brigade. Yet they know little about her except that she’s a sharp fighter/assassin. She seems to have extensive familiarity with the underbelly of US black ops and the high-powered mercenary scene. Lethal may be the most knowledgeable person about Battlestone’s methods, secrets, weapon stashes and bolt-holes, etc.. It was once mentioned that her life seemed to be a long list of mistakes and lost opportunities, perhaps caused by her psychological issues. One of the major missions of the Battlestone/Lethal/Kayo/Boone team was the assassination of the big man of the Japanese underworld, Mr. Soroyama. Though this was originally a covert strike, Battlestone used this feat as publicity within the mercenary scene. This raised their profile considerably. They no longer had to toil deep in the shadows as they previously did. The mercenary unit of Battlestone, Lethal, Boone and Kayo parted ways after a botched operation for Jacob Marlowe. Marlowe had hired them to steal a power orb that was kept in a Youngblood facility. Kayo decided to stick with Battlestone despite his order to leave, but Lethal and in particular Boone left on poor terms. Months later, Battlestone (and Kayo) assembled a group of superhumans called Brigade. It was largely as an attempt to outshine Youngblood, a high-profile government strike team with which Battlestone had a convoluted history. Brigade’s early career went poorly and was marked by casualties. Especially after the covert government assassination team Bloodstrike was sent after them. After Brigade’s inauspicious debut and casualties, Battlestone renewed his contacts with Boone and Lethal. He managed to mend their professional relationship. Boone directly joined Brigade. 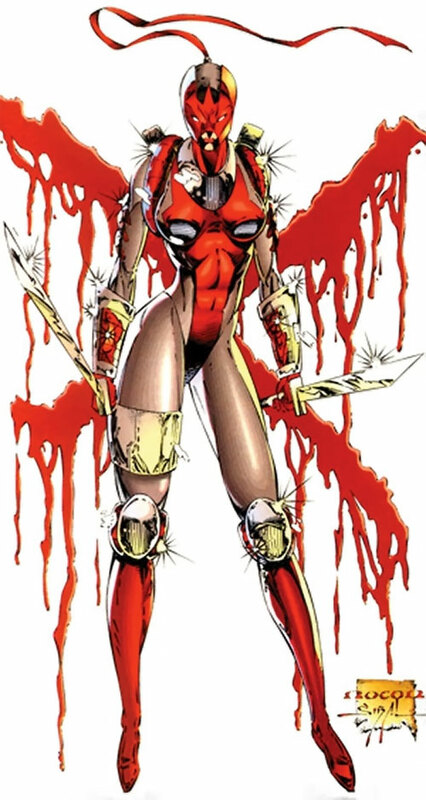 Meanwhile Lethal was sent on a solo mission to recover Brigade members Kayo and Seahawk, who had been captured by Bloodstrike. Using an apparent backdoor within Bloodstrike’s master computer Roam, Lethal succeeded despite opposition by Bloodstrike members. She then stayed for a short while with the team. But Lethal soon left, pointing out that she had only agreed to help with the Bloodstrike situation. Her departure was shortly preceded by Kayo leaving for personal reasons. Some time after she left, Lethal was hired for a mission in Japan. The job turned out to be a test of her abilities prior to the real contract. Lethal was to kill her colleague Kayo, who had embarked on a vendetta against Soroyama criminal interests. She accepted the contract. Though the writing is not terribly clear at that point, my understanding is that she actually intended to save him. Her goal may have been to determine from the inside who wanted to kill Kayo, and why. Lethal eventually located Kayo in a Soroyama covert house. Despite a run-in with the powerful ronin Warcry, she escaped with him. Lethal and Kayo eventually allied with Warcry, Brigade and the WildCATs in taking down the new lord of the Soroyama clan and relieve him of the power orb he owned. Lethal again stayed briefly with Brigade afterwards. However, the team soon disintegrated. Boone turned against them and seemingly killed both himself and Battlestone once his treason was discovered. As the team was coming apart Crypt, a powerful assassin from an alternate future where the former government assassin Chapel ruled as a demon lord, attacked them. He seemingly butchered the entire team except for Seahawk. However, unlike most members of Brigade, Lethal was not killed but shot into the future. She was now in 2025, in a future America chosen to be her personal Hell. There a rational, liberal, peaceful society had banished violence and even swear words, leaving Lethal with nobody to fight and nothing to do. Going stir-crazy and hating every centimeter of this little perfect world, Lethal swore she would find a way to go back to her original time period and timeline somehow. Then she would enact bloody vengeance upon her banisher. After three years (with a ten-month year of 310 days, though), she found a corporation conducting time-travel research. She built or stole the tools to infiltrate it, then sneaked and slashed her way to her objective. It was a trap, though. The corporation was owned by Kayo (either a future version of the time-displaced original) and his accomplice Daria. They had a plan to take over the world and had used Lethal as a pawn. Subsequent events, as well as the nature of the plan, were never revealed. 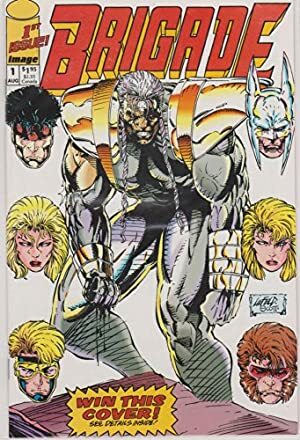 This was one of the casualties of the “Image implosion” around 1996, which saw the discontinuation of numerous series. Being for all intents and purposes lost in the timestream, she could reappear anywhere. Quite possibly with some character development following her experiences. A possible future was glimpsed in Brigade v2 #25. There she was working with a version of Brigade (which included Kayo, Thermal and Coldsnap, despite their seeming murder by Crypt). 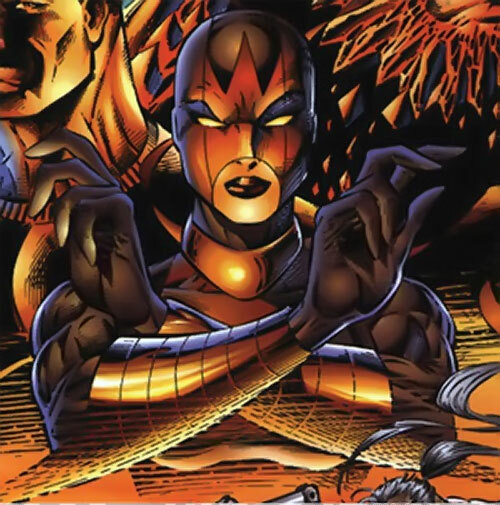 This team was attacked and defeated by a Battlestone-led version of Youngblood. Lethal remains masked at all times. Even when relaxing in a loose top and very short shorts, she still wore her full mask. Her face was never seen until she ended up in an alternate future, when there was no point in her remaining masked. Lethal is brutally independent and disciplined. Her most common reaction by far toward others is annoyance. She’s obviously completely autonomous on an emotional level. Her only link with Brigade was her respect for John Stone, and a vague friendship with Rebecca Haller. She has absolutely no compulsion against killing, and has only disdain for non-combatants and ethics. In fact, she seems to have a pathological need for violence, combat and death, and is aware of it. She sees herself as a stone cold mercenary, only concerned with the efficient application of violence to earn her paycheque. 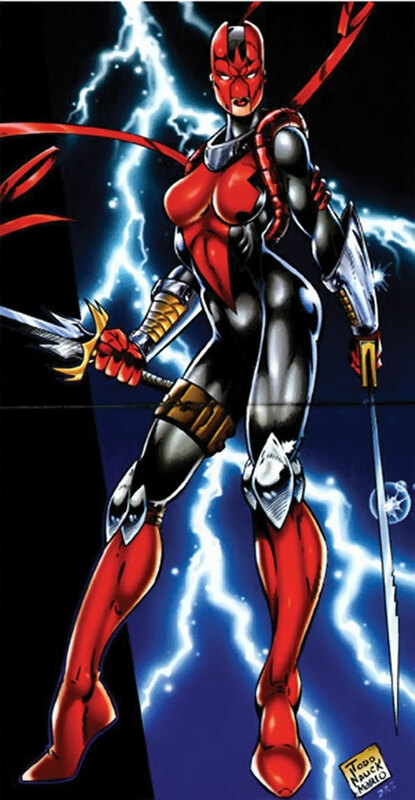 Like most Brigade characters, she’s easy to plug in as just another costumed merc. Battlestone (Low), Roam (High, Powerful). Secret ID, Misc. : Lethal has some sort of psychological addition toward violence. Longsword (x2) [BODY 08, EV 04 (05 w/STR, 08 w/Martial Artist), Sharpness (EV): 01]. COSTUME [BODY 02, Telepathy: 16, Limitation: Telepathy is only useable with Roam, and presumably can be jammed as any point-to-point wireless connection]. Smoke cartridge (x2) [BODY 01, Fog: 03, Grenade Drawback]. In the future, Lethal was seen using an energised katana [BODY 10, EV 10] and some kind of energised cable/lasso [stats unknown]. Full human-level intelligence and speech capabilities. The ability to monitor and operate much of the high-tech equipment used by Bloodstrike members. Access to numerous government databases and networks. And a number of scientific investigation programs. Furthermore, Roam could operate a secret worldwide governmental teleportation network, with unknown specifications and capabilities. I would assume that Lethal somehow had a backdoor and high-privilege user account within Roam. The AI would unhesitatingly follow her orders and conceal her activities from the Bloodstrike agents when requested to. Roam no longer existed in the alternate future Lethal was sent to by Crypt. By Sébastien Andrivet and Hartley Holmberg. Source of Character: Awesome/Extreme universe (Image). Brigade comics books of yesteryear.